I get a bit frustrated with gift guides that are aimed at sexes, mainly because gender stereotypes really get me in a huff, but also because half the time I like most of the stuff aimed at men! With this in mind I decided to create a 3 part gift guide of my own, only instead of aiming the posts at men or women, I chose to gear the gift ideas to people's interests. The three things that I cover here on my blog are exploring, food and creative things, so therefore it felt obvious to create guides based on these subjects. 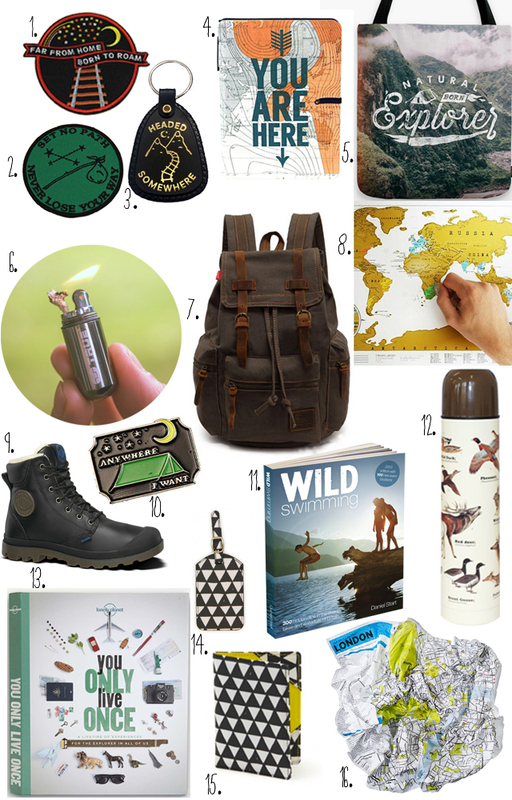 This is my first of three, the Adventurer's Gift Guide. I have included a whole mixture of practical and fun gifts that hopefully appeal to both the female and male adventurer type! Some of my favourites from the above list include the Palladium boots, which make a great stylish alternative to the traditional walking boot and there are loads more styles for both men and women. The You Only Live Once book looks absolutely fantastic with loads of travel ideas categorised by duration i.e. hours, days, weeks etc. I also think the Crumpled City Map is a great idea for the those who would much rather stuff their map into their pocket than waste time carefully trying to fold it back up. I hope these ideas have been inspiring! It annoys me a bit as well that there are predominately gender aimed gift guides around. I love that you've decided to do something different :) I think my favourite thing on this list is the travel scratch map - such a cool idea!